All confirmed women of Zion may become involved with many different activities of Women's ministries. 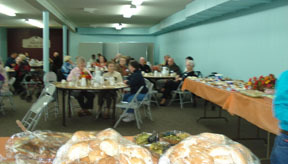 This includes attending one of four Bible study groups as well as Service groups to serve and donate food for funeral luncheons, new member receptions and other special Zion events. Zion Quilters- This group meets September through May making colorful quilts for Lutheran World Relief which are distributed to needy families throughout the world. The quilters also prepare school kits, fabric kits, baby care kits, and personal care kits. All items are donated by Zion members. Purpose Statement: As a community of women, created in the image of God, called to discipleship in Jesus Christ, and empowered by the Holy Spirit, we commit ourselves to grow in faith, affirm our gifts, support one another in our callings, engage in ministry and action and promote healing and wholeness in the church, the society and the world. Mission Statement: To mobilize women to ACT BOLDLY on their faith in Jesus Christ. Fundraising Events-To raise funds to support Zion's women's ministries two major fundraising activities are conducted annually...a Rummage/Bake Sale and a Salad Supper. Food and rummage items are contributed by Zion members and the events are open to the public. Benevolence-A large part of the women's fundraising proceeds are directed to a wide range of charitable interests. These include financial support for local and global disasters, special needs for sister congregations, local food pantries and domestic abuse shelters, social services, missionary support, and special needs support for Zion ministries. Camping scholarship support for Zion 8th grade confirmands has been a special emphasis.